Students examine the development of multiculturalism in Australia and explore ways in which government policies, including immigration and Aboriginal policies have changed over time. Students investigate the historical background to the use of Pacific Islander workers on canefields in Queensland in the nineteenth century. Using the video clip and other sources, what civil and political rights did these workers have? 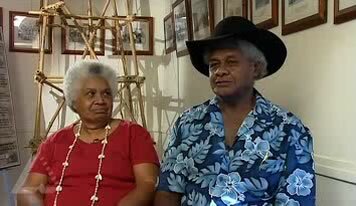 What were the reasons put forward about why they were brought to Australia from islands in the South Pacific region? Under what policies and laws are people today allowed to enter Australia as workers today? Ask students to write their understandings of the following words – culture, identity, self, heritage, kinship, family, racial discrimination, human rights. Then look up the meaning of the words in a dictionary. Finally investigate how the words are used in the video clip. Are Monica and Joe Leo citizens of Australia? How do you become a citizen of Australia? Can you be refused a request to become an Australian citizen? Why did the Leo family want to visit Vanuatu? (locate Vanuatu on map) Is it possible to be an Vanuatu/Australian? Investigate the conditions of Australian citizenship by attending a citizenship ceremony, obtaining information about the conditions of obtaining citizenship, arranging for a comunity person who conducts citizenship ceremonies to visit the class or talking with someone who has recently obtained Australian citizenship. Research the Joskeleigh South Sea Islander Museum in Rockhampton. What function does the Joskeleigh South Sea Islander Museum in Rockhampton play in the life of the Leos and other Australian South Sea Islanders? Ask students to consider a range of issues about citizenship in Australia. If you are born in Australia are you automatically an Australian citizen? How can you become an Australian citizen? Can your Australian citizenship be taken away from you? For what reasions are immigrants alowed to be become Australian citizens? In small groups, ask students about the value of having immigrants agree to a pledge/sign an agreement before they become citizens of Australia. Investigate the current debate about the changing requirements of becoming an Australian citizen. Ask students to create a suitable pledge.